Very variable, rosette-forming annual or biennial, distinguished by the stalkiess leaves, with shiny, hairless upper surfaces and white, woolly-haired lower surfaces. The leaves die off by the time of flowering. The small,whitish flower heads are in dense clusters along the erect flowering spike. Flowers Inflorescence an elongated spike of numerous tight clusters of small, whitish composite flower heads, each about 3 mm across. Flowers Sep-Mar. Fruit Small, minutely-pimpled achenes about 0.6 mm long. Leaves Basal leaves stalkless, broadest towards the tip, 2-11 cm long. Leaves usually dead at flowering. Lower stem leaves shiny and hairless on upper surface and densely woolly underneath. Upper stem leaves smaller, broader, sometimes folded. 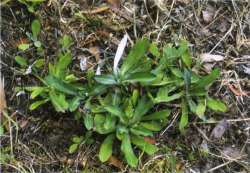 Stems Erect or curved upwards at the tips, one or several arising from the rosette. Wet or stony sites in forest margins and clearings, lawns, pasture, cultivation, river-beds and coastal places. A weed of some crops like asparagus. Common throughout NI. 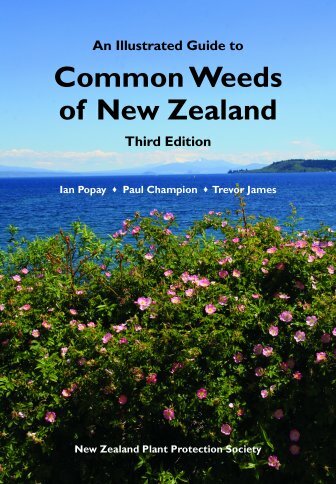 Common in Nelson, Marlborough, Westland and Fiordland in SI. Originally from South America. Most common of the naturalised spicate cudweeds. Several other introduced cudweeds also occur in similar habitats. Gamochaeta purpurea (formerly Gnaphalium purpureum) has leaves woolly-hairy on both surfaces, and is scattered throughout NI. Gamochaeta simplicicaulis (formerly Gnaphalium simplicicaule) has thick stems and a leafy inflorescence, occurring north from Waikato and in the Bay of Plenty. The native Japanese cudweed Euchiton spaericus (formerly Gnaphalium sphaericum) has dense, spherical flower heads about 2 cm in diameter, with four leaves immediately below it, on upright stems about 20 cm long and is common throughout NZ in lower rainfall (below 1000 mm) areas. Gamochaeta (Gr.) = jointed bristles; spicata (Lat.) spike, ear of grain.